Anyone who spends time with students will have overheard a conversation like the one I did recently on the bus. “Nine grand! Where does it all go?” was the comment from someone totally unaware of the real costs of providing the higher education experience. During the USS strike, many signed petitions neatly dividing up their fee by the number of taught contact hours, forgetting the costs of the library, IT, student support, and the estate. And fee transparency has been a key manifesto pledge for students’ union officers for years – but few have ever managed to chalk it up as a “win”. When the fundamentals of the current undergraduate fee scheme were developed, the government envisaged value for money and information about where fees were being spent to be a central element of the system. In 2010’s “Students at the Heart of the System” white paper, a commitment was made on the finances of providers to “work with HEFCE to … promote greater transparency and help inform the choices of prospective students”. Later, in the January 2013 grant letter from the government to HEFCE, Vince Cable and David Willetts argued that “under the reformed HE system, students will legitimately want to understand what their fees pay for. This places the onus on institutions to provide clear information and to be able to demonstrate value for the fees charged”. HEFCE responded later in the year by commissioning work that found there was interest in this type of information, but what was published was limited, not easy to find, and often difficult to understand. It then argued that providers should make the information more accessible, position it clearly on institutions’ own websites, make it clear, provide a useful level of detail, and that data should be comparable – making it possible for students to compare “financial information for different institutions and over time”. HEFCE went on to issue optional guidance to higher education providers, but little has changed. A 2018 report commissioned by the Office for Students that I was involved with found that 22% of UK-domiciled students “definitely disagreed” that their tuition fees were value for money with only 7% “definitely agreeing” that they were. This year, Universities UK research found that students “expressed frustration that they could not see a breakdown of costs attributed to tuition fees”. 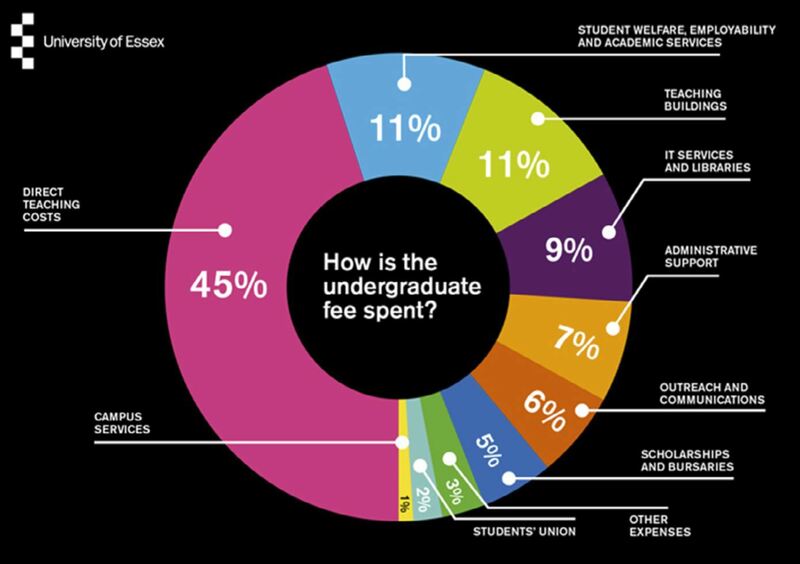 And in HEPI/Advance HE’s Student Academic Experience Survey this year, some 75% of UK-domiciled respondents stated that their universities had not provided enough information on how fees are spent. There seems to be a worry that telling students where their money goes will upset them. But ironically, research shows significant overlap between the areas that students want their money to go towards and the areas where their money ends up. The most popular spending categories in the HEPI/Advance HE research – teaching staff and teaching facilities – are also the ones that receive the highest proportions of fee income. And the OfS work found that when it comes to perceptions of value for money, satisfying the hygiene factor of knowing which outputs money goes to, was key to students buying into and understanding the motivator factors of wider educational, social and employment benefits. There is also a sense from private conversations with providers that being honest about the cross-subsidies involved in teaching different subjects, providing support to students that need it, and running bursary and scholarship schemes would somehow undermine the system. But this shows little respect for students. Bright, sophisticated and reasoned students will understand and respect the reasonable cross-subsidy decisions that a provider makes, but only if it is open about them. Being much clearer about where the money goes is the subject of a new HEPI paper that I’ve contributed to called “Following the Pound”. It contains ten simple recommendations that the sector should rally around. The benefits could be huge. Being more open will promote confidence among students and the wider public that tuition fee income (and other sources) is being put to good use, and not being wasted. They arguably have a right to know the use to which their tax is being put. If we believe in a diverse sector where autonomous institutions can make different investment decisions, transparency should affect and influence student choice, with prospective students using the data to evaluate different courses or providers. If we believe in working in partnership with students, being more open with their representatives should enable them to influence expenditure (or student charges) decisions in the interests of students. Many providers are already in the process of developing a “Wagon Wheel” pie chart of income and expenditure for their students. But I’ve also identified some mistakes that people might make along the way. Headline income and expenditure data tend not to say which activities at each institution provide substantial losses or surpluses. For a full understanding of institutional finances, elements such as income and expenditure from trading activities (i.e. housing or catering) need to be clearly portrayed to students as generating a net profit or loss. In much-published data, it can be difficult to distinguish research from teaching. Yet “transparent approach to costing” data manages to differentiate between the two. So it should be possible to display this information to students. If institutions are proud of delivering research-led teaching, then making such data available could emphasise the perceived link. Because institutions present figures in different ways, it can be difficult for students or their representatives to carry out meaningful comparisons. Yet the accounting statement of recommended practice followed by HE institutions enables some comparability, and collective efforts should be made to ensure information can be meaningfully compared by students between institutions. It is tempting to produce marketing material that focuses on the wider benefits of HE. But the research suggests that it is only when students are happy that they get value for money on inputs, that they can turn their attention to outcomes and impacts. As long as students feel ripped off by printing costs, gym fees, lattes or halls, they will feel that their university was not value for money. Any university that knows more about its own finances than the plight of its poorer students should review how it makes decisions. Involving students (say from the students’ union) in financial decision making is not the same as promoting confidence amongst the student body that the money is being spent wisely. Both should happen. There are some that have argued that the current loan system is preferable because it hides the subsidy from the public going into higher education. That may be so, but it is democratically deficient; and it does mean that if that subsidy comes onto the books after the Office for National Statistics review, we’ll have lost many years’ opportunity to tell taxpayers why subsidising higher education is a great idea. For students, it’s long been obvious that hiding the subsidy from them – which only manifests if they are deemed economically unsuccessful in thirty years time – has negative effects on their acceptance of the system that they carry into their twenties (and to the ballot box). But students in Scotland worry about value for money too. Regardless of the balance of contribution between taxpayer and individual, it’s daft to not tell them where the money goes. Faced with a gap in information, people think the worst. If the sector wants to protect the unit of resource it deploys on higher education, it should probably want students to think the best. Many students though do see that VFM is a longer term question, and isn’t just about prices of things whilst they are studying. The wagon wheel approach has worked with many students’ understanding of where the tuition fee income goes and so is a useful tool. Adding more into this approach may just confuse students, notably TRAC data which isn’t intended for this purpose and has its limitations. The SORP does give comparability but individual HEIs will account for things differently internally at a more detailed level. Maybe a wagon wheel or two, with a few words of explanation is the way forwards, but let’s not ditch the simplicity. Most students are more worried about living costs and another means of communication is to demonstrate the ongoing cost of their HE to them after they have left. When broken down into a monthly cost at given salary levels, the number is far more palatable and can then be used as a much better measure of value.